Keeping in mind the various requirements of the customers, we are involved in offering best quality of P.P Clamps. The offered P.P Clamps are manufactured by using high grade material and also tested for its quality assurance in various parameters while manufacturing. 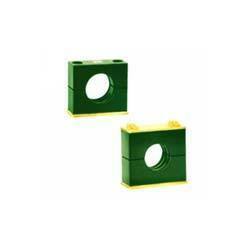 Size Range: 1/2"-4", 1/2''-10, 1/2''-10", 1/2"-6", 1/2"-8'', 1/2"-2"
We are a top notch supplier of PP Clamp. PP Hydraulic Pipe Clamp 1/2" - 16"
We are the manufacturers of Polypropylene Hydraulic Clamps ranging from 1/2" to 16". We also deal in stacked type pipe clamps also. Kindly enquire for price. By keeping in pace with the latest and upcoming developments in the market, we are engaged in putting forth an extensive collection of Heavy Duty PP Pipe Clamps Set. Our reputed entity is engaged in supplying PP Clamp. 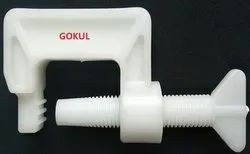 Owing to the presence of our expert team members, we are able to offer a wide range of PP Pipe Clamp.